“It will be crowded with tourists and boats, the bay won’t look the same as in the movie and you won’t experience the paradise island feel that the movie portrays”. 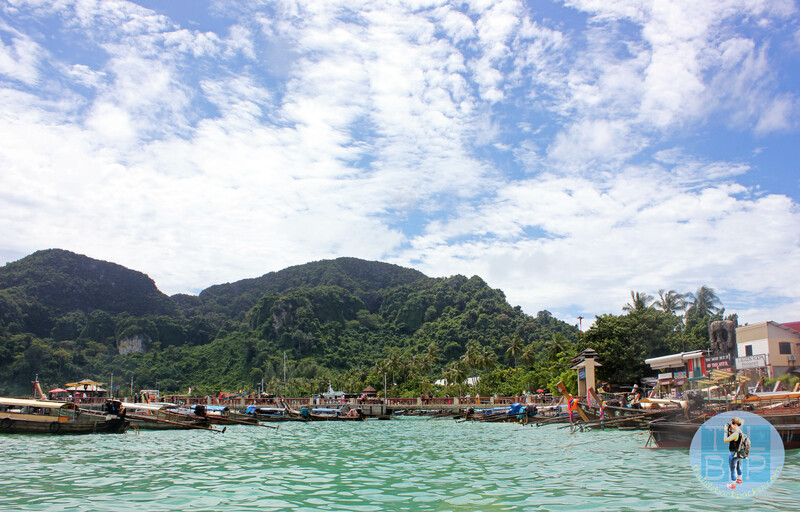 As I trawled the internet for advice on which boat trip to take from Phi Phi Don to Phi Phi Leh, all I could find was negative comment after negative blog about the real ‘beach’. Now I am not one to let someone put me off a trip with their negative comments, so I decided to experience it for myself and make my own decision. Was it really going to be that touristy and overcrowded? We chose to take the sunset tour which departed around 2pm, booked through a shop a few doors down from our guesthouse – Tara Inn; this shop also seemed to be the main dealer for the trip. We paid B350 each for the trip which wasn’t bad considering most trips were about B400. We were given water and some rice thing for our lunch before heading down to the pier and boarding our big longtail boat which seemed to take forever. Eventually we got away from the beach and out on the water. Unfortunately for me the boat ride and my hangover didn’t mix. This resulted in me having terrible travel sickness, however by some miracle I wasn’t sick! 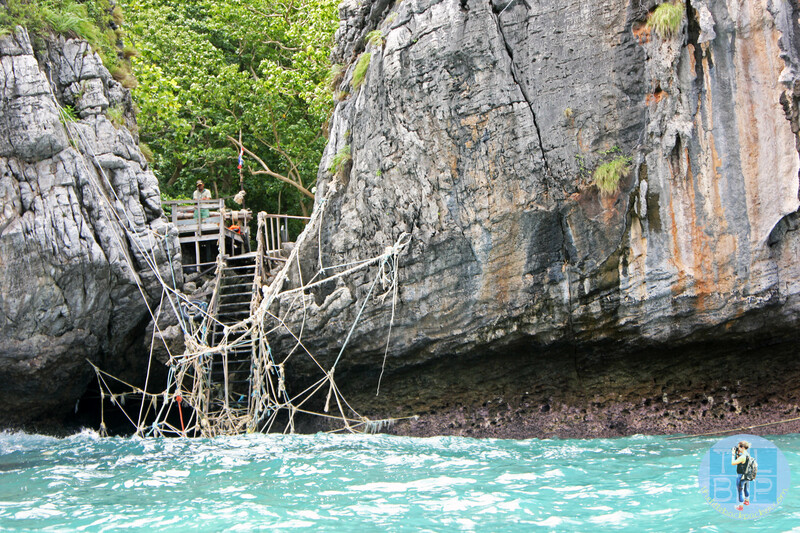 We pulled up at Lo Sama Bay and were told to hand our cameras over, pay B100 fee each, jump in the water and swim over to the dodgy looking rope ladder. Now I am terribly afraid of open water, but given the current state of my travel sickness I knew I had to get off the boat ASAP. It was a difficult swim and it had me wondering how people who can’t swim would get on on this trip as we were not informed at the beginning that we would be swimming to a rope ladder. Trying to get up the rope ladder was even harder but eventually we made it and I couldn’t help but feel I was having my own little adventure before reaching the beach. Grabbing my camera from the waterproof bag, I made a bee line for the beach. Upon arriving, two things struck me: the colours were gorgeous proper white sand and turquoise blue sea; and the bay had a gap in it. I obviously hadn’t done my homework correctly because later I read up on the production of the film and found out the special effects guys added in more of the surrounding landscape to create that 360 degree bay effect. I didn’t know what to make of the tourists – was this a lot or not? I mean, they weren’t covering the whole beach, they had just stopped in the centre where the path brings you out at, but there was a large group stood in that one spot. There were several boats in the bay, all speed boats which looked modern and ugly unlike the typical longtail boat which was waiting round in the other bay. If you compared the scene to Whitehaven beach (or similar) then it was no more crowded than that, but if you compared it to the deserted beach from the film or the paradise beach we found on Koh Rong then it was packed with people. We were given an hour to soak up the beach and so I wandered off to the shade for a sit down. As I walked along the shore line I noticed a line of rubbish cluttering the beach and I was suddenly thankful this island is otherwise untouched: no holiday bungalows, no locals and just one sleeping overnight boat trip. 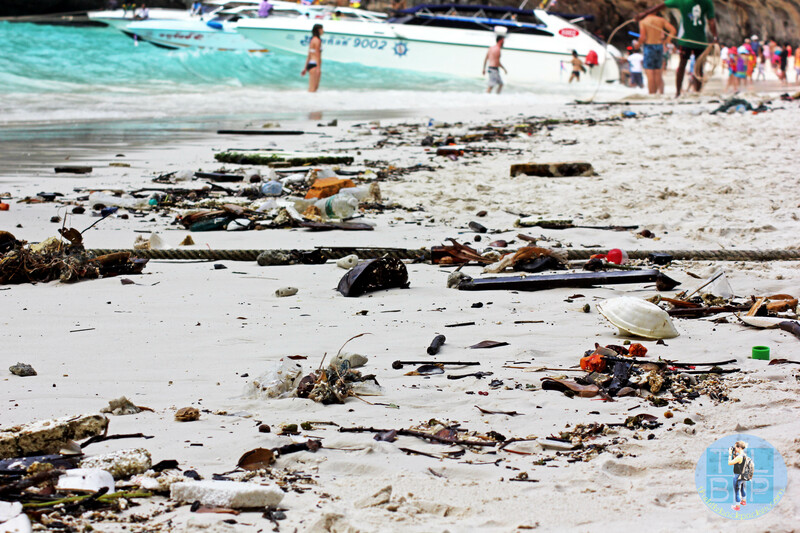 While I was worrying about the rubbish I noticed that all the boats had slowly begun to leave, the crowd of tourists had really thinned out and suddenly I didn’t understand what all of the negative comments I had read online were about. Yes it was a little packed when I arrived but now the crowd was half the size and we managed to snap several photos of people free beach. Not only that but the beach is beautiful, the colours are gorgeous, the sand so soft and the water so warm. Getting back to the boat was just as challenging, with the ladder even more unsafe on the climb down. Not only that but people were trying to climb up at the same time. The water was rough and I was very thankful for all my swimming practice in Melbourne. The boat then took us past the Viking Caves and to an area for snorkelling. The coral in this area isn’t as bright as other parts of Thailand but the visibility was still good and we saw plenty of colourful fish. We then headed back after the snorkelling; with it being before 5pm we were given the option to wait out the sunset sat on the boat in the middle of the water, or visit monkey beach and head back, missing sunset. As a group we chose to visit monkey beach and head back – however I can see many boats having problems trying to get everyone to agree on one option. 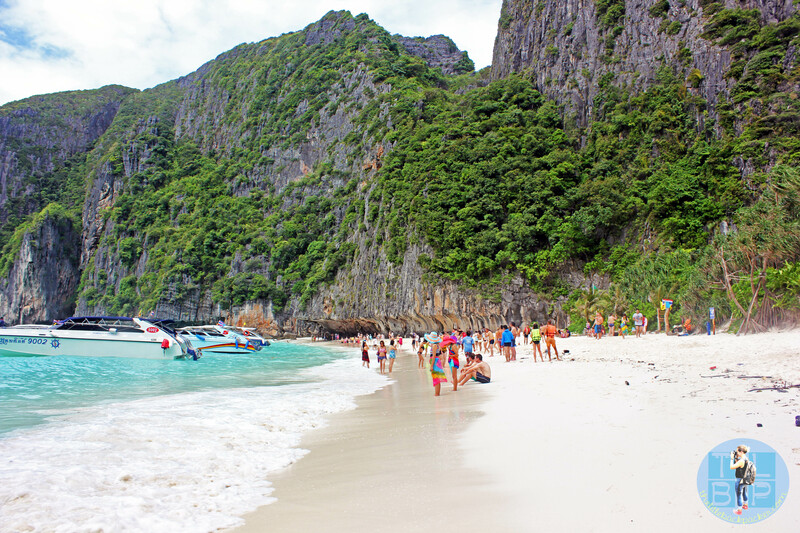 I was so happy I didn’t listen to the negative comments online and still took the trip to Maya Bay. Despite my travel sickness at the start I really enjoyed the trip; we had a good amount of snorkelling time and our visit to the beach wasn’t all crowded. Everyone was visiting that beach for the same reason so despite there being other people around it still felt quiet. I wasn’t keen on the boats dotted along the beach; however these quickly disappeared and we were able to get several photos without people in. The beach is the beautiful place from the film, just don’t get confused with the landscape effects like I did. The boat trip itself didn’t stick to the itinerary, nor was anything explained very well, but then this is Thailand so I wasn’t expecting too much. My verdict is people have become so used to rocking up on a Thai island and being one of a few backpackers there; exactly like the storyline of the film. 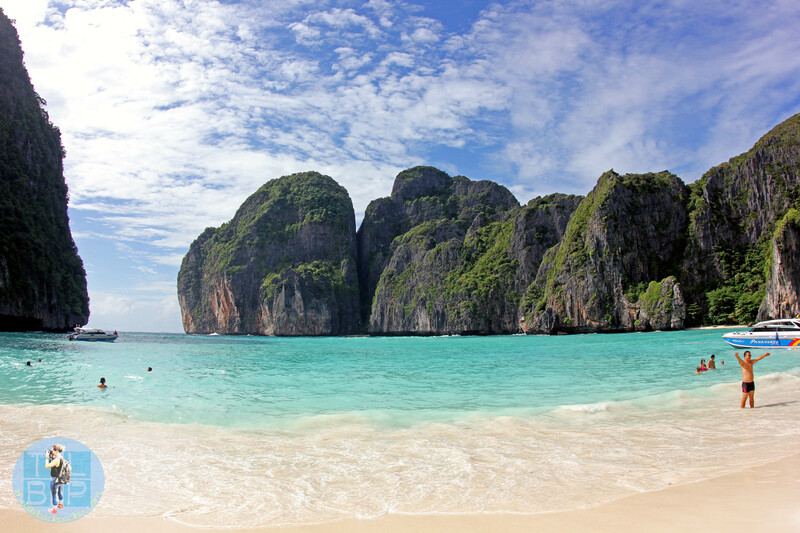 The problem with Maya Bay is, it’s become a tourist attraction because it is famous and popular and beautiful and worth a visit. I’m not saying you will get the beach to yourself but what I am saying is: it’s popular for a reason, don’t skip it just because it’s what everyone else is doing and you want to be different. Man, when I went the beach was much more crowded than in your picture. It was overrun with tourists that it became difficult to move around. But I agree, it’s worth a visit to see. 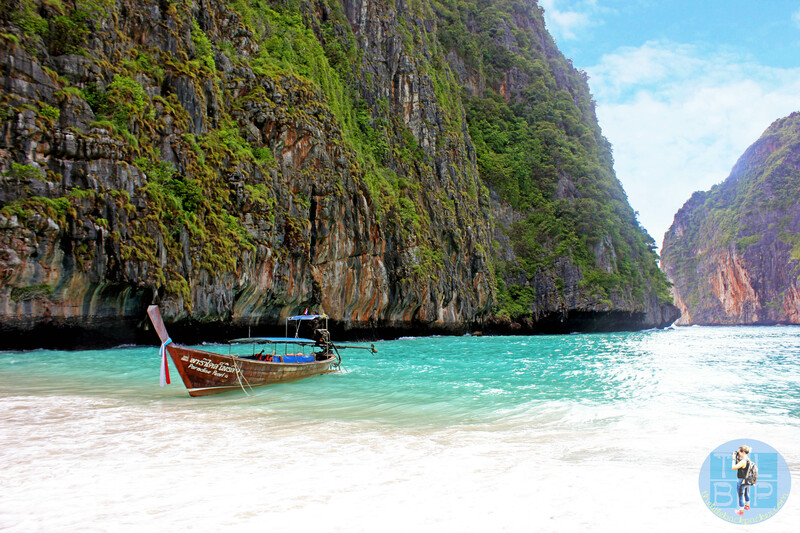 Hi, may I know what time did you arrive in Maya Bay? I don’t understand, you describe the rope ladder experience as a way to get to the island, but in your pictures I see the boats by the beach. Why would you need the rope ladder for? Only specific boats (which are extremely expensive or private) are able to dock in the bay of the beach. Most boats that carry tourist or at least backpackers dock round the back of the island near the rope ladder.